African American men are more likely to develop prostate cancer than men of any other race. Our lack of understanding about the increased burden of prostate cancer in African American men remains one of the most important unanswered health disparities in the U.S.
Over the past year, we have brought together a team of prostate cancer researchers and experts from across the country to launch a national study focusing on prostate cancer in African American men. This is the RESPOND study (Research on Prostate Cancer in Men of African Ancestry: Defining the Roles of Genetics, Tumor Markers and Social Stress). The RESPOND Study will be one of the largest studies ever to look at the underlying factors and reasons that put African American men at higher risk for prostate cancer. 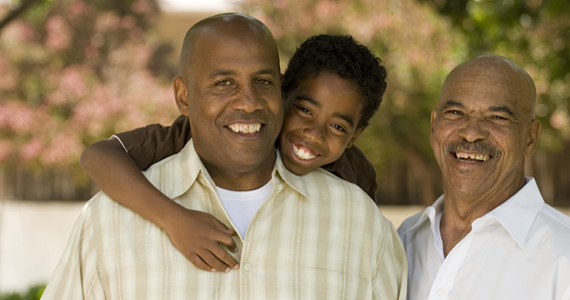 Over the next five years, 10,000 African American men with prostate cancer will be recruited. We will be requesting African American men who have been recently diagnosed with prostate cancer to contact us to learn more about the study. Participation includes completing a survey, providing a saliva sample and allowing researchers access to tumor tissue that has already been obtained and is stored at their diagnosing or treating facilities or pathology laboratories. This information will be used by researchers to study how exposure to stress over a lifetime, inherited susceptibility (i.e. genes), and tumor characteristics contribute to the development of prostate cancer. It is expected that the information gained from RESPOND will lead to more effective interventions for preventing the disease, earlier diagnosis, and developing new treatment strategies for African American men. If you are African American and have been diagnosed with prostate cancer, or know of someone who has been diagnosed with prostate cancer please contact us to learn more about this important study. Only through hearing from African American men with prostate cancer can we learn about the factors and reasons that influence African American men’s risk of developing prostate cancer. The RESPOND study is supported by the National Cancer Institute and the National Institute on Minority Health and Health Disparities of the National Institutes of Health, under grant number CA214253, awarded to the University of Southern California in Los Angeles. The content of this product is solely the responsibility of the authors and does not necessarily represent the official views of the National Institutes of Health. Additional funding for RESPOND is provided by the Prostate Cancer Foundation. NIH is providing 96% of the total funding ($25.5 million) and PCF is providing 4% of the funding ($1 million).